Background: Neuraxial labor analgesia using new local anesthetics such as levobupivacaine has become very popular by virtue of the safety and lesser motor blockade caused by these agents. Combined spinal-epidural analgesia (CSEA) has become the preferred method for labor analgesia as it combines benefits of both spinal analgesia and flexibility of the epidural catheter. Adding opioids to local anesthetic drugs provide rapid onset and prolonged analgesia but may be associated with several maternal and fetal adverse effects. The purpose of this study is to compare fentanyl and tramadol used in CSEA in terms of duration of analgesia and frequency of the adverse fetomaternal outcome. Materials and Methods: A total of 60 primiparas with a singleton pregnancy in active labor were given CSEA after randomly allocating them in two groups of 30 each. Group I received intrathecal 2.5 mg levobupivacaine + 25 μg fentanyl followed by epidural top ups of 20 ml 0.125% solution of the same combination. Group II received 25 mg tramadol instead of fentanyl. Epidural top ups were given when parturient complained of two painful contractions (visual analogue scale ≥ 4). Data collected were demographic profile of the patients, analgesic qualities, side- effects and the fetomaternal outcome. 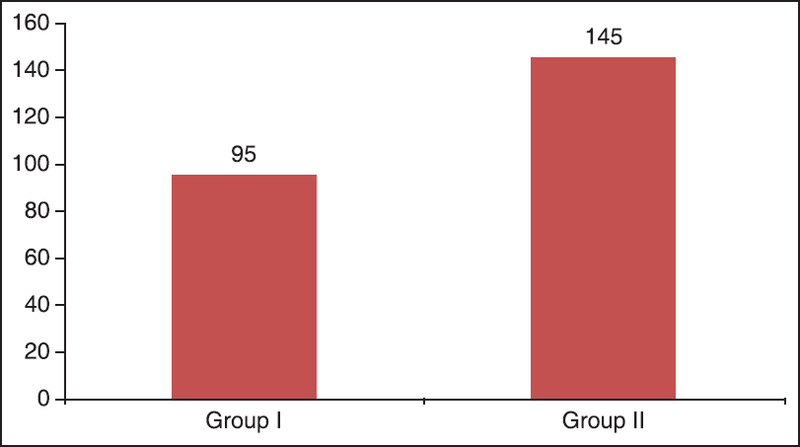 Results: Patients in Group II had significantly prolonged analgesia (145 ± 9 minutes) than in Group I (95 ± 7 minutes). Patients receiving fentanyl showed rapid onset of analgesia, but there were more incidence of side-effects like shivering, pruritus, transient fetal bradycardia, hypotension, nausea and vomiting. Only side-effect in the tramadol group was nausea and vomiting. During labor, maternal satisfaction was excellent. Conclusions: Adding tramadol to local anesthetic provides prolonged analgesia with minimal side effects. Fentanyl, when used as adjuvant to local anesthetic, has a rapid onset of analgesia but has certain fetomaternal side-effects. Labor is a painful process of childbirth, which can be the most agonizing event experienced by the majority of women. This distress may harm the mother and fetus. Painful labor often results in excessive maternal stress, mechanical workload, increased oxygen demand and hyperventilation resulting in increased catecholamines secretion leading to uterine vasoconstriction, increased uterine contractility, hypoperfusion of the fetoplacental unit, fetal hypoxia and acidosis. These responses can easily be obtunded by providing analgesia during labor. Studies on levobupivacaine and tramadol for intrathecal labor analgesia are very few. Hence, the present study was designed to compare fentanyl and tramadol used in CSEA in labor. The primary outcome of the study was the duration of analgesia of the intrathecal drugs. The secondary outcome was the assessment of onset of analgesia, motor block, maternal and fetal outcomes, incidence of side-effects like pruritus, nausea, vomiting, headache, shivering and fetal heart rate changes. Group I received 2.5 mg isobaric levobupivacaine with 25 μg fentanyl intrathecally followed by epidural top-ups of 20 ml 0.125% solution of the same combination. Group II received 2.5 mg isobaric levobupivacaine with 25 mg tramadol intrathecally followed by epidural top-ups of 20 ml 0.125% solution of the same combination. Double blinding in any clinical trial is used to remove any possibility of bias by keeping both the experimenter and the subject from knowing what is being tested. In our study, the patient as well as the anesthesiologist administering the drug did not know which drug was used. The drug was prepared by another anesthesiologist who was not directly involved in the study. Exclusion criteria consisted of patients of ASA grade III and IV, patients having bleeding diathesis and on anticoagulant therapy, raised intracranial tension, cephalopelvic disproportion, preterm gestation, deformity of vertebral column, e.g., scoliosis and kyphosis, preexisting neurological deficits in the lower extremities, any sign of infection at puncture site, history of cardiac arrhythmias, hypertension, history of anaphylaxis to local anesthetic and drugs to be used, gestational age <35 weeks, nonsingleton pregnancy, nonvertex presentation and body mass index of 35 or more. Before the initiation of analgesia, the following parameters: Maternal age, height, weight, gestational age, cervical dilatation, use of oxytocin and parity were recorded. Baseline pain score was assessed using visual analogue scale (VAS) (VAS; 10 cm; 0 = no pain and 10 = worst imaginable pain) before the CSEA. An intravenous (i.v.) access was achieved in every parturient and preloading was done with 10 ml/kg body weight of lactated Ringer's solution. The CSEA using a needle through needle technique, was performed with parturients in left lateral position, under all aseptic precautions at L2-L3 or L3-L4 level. Epidural space was sought with the help of 18-gauge Tuohy's needle using loss of resistance technique. A 25-gauge Whitacre spinal needle was passed in the same space through the epidural needle and the correct position of the tip in the intrathecal space was confirmed by observation of free flow of cerebrospinal fluid (CSF). The prefilled study drug was injected intrathecally. Epidural catheter was threaded through the needle, aspirated to confirm the absence of blood or CSF, but test dose was not administered because administration of traditional epidural test dose causes unwanted loss of proprioceptive and motor functions, the preservation of which are necessary to permit safe ambulation in labor. The parturient was turned supine, and a wedge was placed under the right buttock to prevent aortocaval compression. Maternal blood pressure, heart rate, respiratory rate, oxygen saturation were measured noninvasively by a blinded observer every 2 minutes for 10 minutes, then every 5 minutes for 30 minutes, every 15 minutes for 120 minutes, every 20 minutes from 120 to 300 minutes or delivery of fetus whichever was early. Maternal hypotension was defined as a fall in systolic blood pressure of >20% from the baseline and was treated by giving i.v. fluid boluses and if necessary, giving i.v. ephedrine. Fetal heart rate was also monitored with continuous cardiotocography throughout the study. At any evidence of fetal bradycardia, obstetrician was consulted when necessary. Time of onset was taken as the time between intrathecal injection till the time when parturient became pain-free (VAS = 0). Duration of analgesia was taken from intrathecal injection to the time of request of additional analgesia for painful contractions (VAS ≥ 4). Highest dermatome level, degree of motor block using modified Bromage scale [Table 1] and side effects were assessed and documented. The highest dermatome sensory block was tested in each dermatome bilaterally for the loss of pinprick sensation using 26-gauge needle. Patients satisfaction score was noted at follow-up visit after 24 h of delivery with a scale; 5 – excellent, 4 – very good, 3-good, 2-fair, 1-poor. The data was analyzed using "Statistical Package for the Social Sciences" version 17.0 (SPSS Inc., Chicago, USA). Patient and obstetric data are presented as the mean ± SD or % or number of patients, as appropriate. Analysis was carried out using Chi-square test and Student's unpaired t-test for nonparametric and parametric data respectively. The P-value was set as the level of significance, if <0.05 = significant at 5% significance level; if P < 0.01 = significant at 1% significance level and a P < 0.001= highly significant. The sample size of this study was computed by difference in duration of analgesia between the two groups with a power >95% and α = 0.05. Among 60 parturients enrolled in the study, none of them were excluded out of the study for any reason. There were no technical problems in the administration of the intrathecal study drugs or inserting the epidural catheters. Patients in both the groups were comparable in their demographic profile. Demographic details and obstetric parameters are shown in [Table 2]. 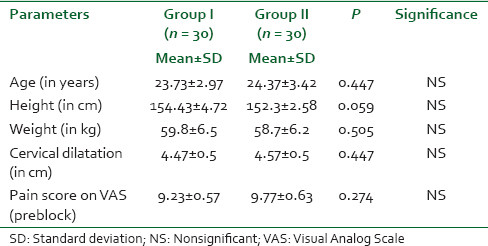 [Figure 1] shows the VAS score in both the groups. 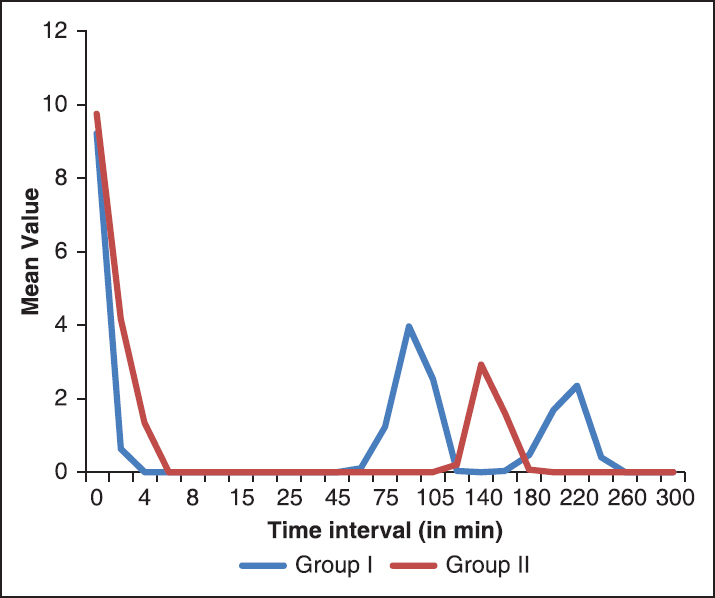 [Figure 2] shows the significantly prolonged duration of analgesia in group II. The effects of the study solution are shown in [Table 3]. 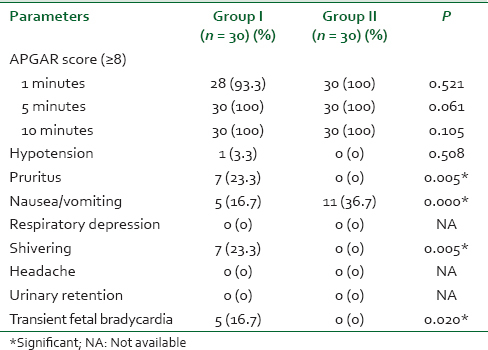 APGAR score and side effects of both the groups are shown in [Table 4]. There was no incidence of any cesarean section or instrumental delivery. "Walking epidural" is preferred for labor analgesia as ambulation in labor increases the intensity of uterine contractions and may, therefore, result in more effective progression of labor. Levobupivacaine causes lesser motor blockade as compared with bupivacaine and is therefore preferred. Cervical dilatation at the time of initiation of labor analgesia has an impact on the outcome of labor. Most observational studies showed a higher rate of caesarean delivery when labor analgesia was initiated early in labor (≤2 cm). The American College of Obstetricians and Gynaecologists statement had suggested that EA may be delayed until a cervical dilatation of 4-5 cm is reached based on the study published by Pandya. However, a recent report by the ASA task force on Obstetric Anesthesia concluded that cervical dilatation at the time of epidural administration does not impact the outcome of labor. In our study, we appropriately timed the initiation of analgesia at cervical dilatation between 3 cm and 5 cm. The mean onset of analgesia of patients in Group I was 1.85 ± 0.49 minutes and Group II was 4.57 ± 0.50 minutes. Onset of sensory block in Group I was found to be earlier than in Group II. Frikha et al.,  in their study comparing sufentanil 2.5 mg and tramadol 25 mg concluded that sufentanil group had a rapid onset of analgesia than tramadol combined to bupivacaine. The mean duration of spinal analgesia was significantly greater with Group II 145.83 ± 9.11 minutes than Group I which was 95.67 ± 7.96 minutes with a P = 0.001. In a study done by Chan and Chiu  using 2.5 mg levobupivacaine and 25 μg fentanyl intrathecally, the duration of analgesia was 101.4 ± 26.64 minutes. Hepner et al.,  in their study comparing CSEA and epidural analgesia (EA) showed the duration of intrathecal component of CSE group to be 91.1 ± 32.6 minutes. Pascual-Ramirez et al.,  compared CSEA and EA on labor and delivery durations and found the average duration of intrathecal analgesia to be 113 ± 93 minutes. Continuous search for balanced labor analgesia that provides relief from pain, while preserving motor function, has led to the development of an ambulatory labor analgesia technique. In our study grade of motor blockade was measured using Bromage scale. 93% patients had grade 0 motor blockade, and none of the patients had grade 2 and 3 blockade in both the groups with P = 0.067. Vercauteren et al.,  comparing bupivacaine and levobupivacaine found bromage 1 motor block in 34% patients in the bupivacaine group and no motor impairment in levobupivacaine group. The most common side effect experienced by our patients in fentanyl group was pruritus in 7 patients; hypotension in 1 patient; nausea and vomiting in 5 patients; shivering in 7 patients and transient fetal bradycardia in 5 patients. The only side-effect noticed in the tramadol group was nausea and vomiting seen in 11 patients. The fetal outcome of all the babies was good in both the groups. APGAR scores were favorable at 1 minutes, 5 minutes and 10 minutes. Palmer et al.,  in a retrospective study compared the incidence of fetal heart rate abnormalities after institution of two techniques of labor analgesia (either subarachnoid fentanyl or conventional epidural labor analgesia). Both techniques were associated with 6-12% incidence of fetal heart abnormalities and no difference in neonatal outcome was found. Our study demonstrated that fentanyl group provides rapid onset of analgesia compared to tramadol group, but tramadol gives longer duration of analgesia. Major side effect in the tramadol group was nausea and vomiting which is attributable to its action through 5-hydroxytryptamine receptors. , whereas shivering, pruritus, transient fetal bradycardia were seen predominantly in the fentanyl group. Patient satisfaction score was also better in the tramadol group. There are some obvious limitations of our study. First, cord blood pH, which is an objective retrospective measure of the fetal exposure and response to hypoxia during labor and the timing of cord blood clamping, is critical for the interpretations of cord blood gases. All these could not be done effectively in our setup due to some technical issues. Second, although epidural administration of tramadol has been extensively used for analgesia by numerous investigators in clinical studies, more studies are needed to assess the safety of its intrathecal administration for labor analgesia. Third, levobupivacaine is also a newer local anesthetic, and there are only few studies supporting its use for obstetric analgesia, more studies are needed to establish the safety and efficacy of this drug in labor analgesia. The result of our study could have been more precise if the sample size of study group would have been large, but the patients willing for labor analgesia were limited in our institution. Lastly, we had no control group of patients who received either i.v. labor analgesia or who did not receive any analgesia, so we could not comment on prolongation of the second stage of labor or overall duration of labor. We concluded that IT fentanyl combined with levobupivacaine provides rapid onset and profound analgesia with some maternal and fetal side-effects, whereas IT tramadol with levobupivacaine provides longer-lasting analgesia. The major side-effect is vomiting. Labor analgesia in both the groups, that is, fentanyl and tramadol group was effective and patients were hemodynamically stable throughout the labor. Although both drugs could be used to provide pain relief during labor, intrathecal tramadol was better with respect to prolonged analgesia and lesser side-effects. Lee BB, Ngan Kee WD, Hung VY, Wong EL. Combined spinal-epidural analgesia in labour: Comparison of two doses of intrathecal bupivacaine with fentanyl. Br J Anaesth 1999;83:868-71. Singh H, Yang J, Thornton K, Giesecke AH. Intrathecal fentanyl prolongs sensory bupivacaine spinal block. Can J Anaesth 1995;42:987-91. Lim Y, Ocampo CE, Sia AT. A comparison of duration of analgesia of intrathecal 2.5 mg of bupivacaine, ropivacaine, and levobupivacaine in combined spinal epidural analgesia for patients in labor. Anesth Analg 2004;98:235-9. Collis RE, Davies DW, Aveling W. Randomised comparison of combined spinal-epidural and standard epidural analgesia in labour. Lancet 1995;345:1413-6. Nageotte MP, Larson D, Rumney PJ, Sidhu M, Hollenbach K. Epidural analgesia compared with combined spinal-epidural analgesia during labor in nulliparous women. N Engl J Med 1997;337:1715-9. Cohen SE, Tan S, Albright GA, Halpern J. Epidural fentanyl/bupivacaine mixtures for obstetric analgesia. Anesthesiology 1987;67:403-7. Stoddart AP, Nicholson KE, Popham PA. Low dose bupivacaine/fentanyl epidural infusions in labour and mode of delivery. Anesthesia 1994;49:1087-90. Kuczkowski KM. Ambulation with combined spinal-epidural labor analgesia: The technique. Acta Anesthesiol Belg 2004;55:29-34. ACOG Committee on Obstetric Practice. ACOG Committee Opinion number 269 February 2002. Analgesia and cesarean delivery rates. American College of Obstetricians and Gynecologists. Obstet Gynecol 2002;99:369-70. Frikha N, Ellachtar M, Mebazaa MS, Ben Ammar MS. Combined spinal-epidural analgesia in labor - comparison of sufentanil vs tramadol. Middle East J Anesthesiol 2007;19:87-96. Chan SY, Chiu JW. Intrathecal labor analgesia using levobupivacaine 2.5 mg with fentanyl 25 microg - would half the dose suffice? Med Sci Monit 2004;10:PI110-4. Hepner DL, Gaiser RR, Cheek TG, Gutsche BB. Comparison of combined spinal-epidural and low dose epidural for labour analgesia. Can J Anaesth 2000;47:232-6. Pascual-Ramirez J, Haya J, Pérez-López FR, Gil-Trujillo S, Garrido-Esteban RA, Bernal G. Effect of combined spinal-epidural analgesia versus epidural analgesia on labor and delivery duration. Int J Gynaecol Obstet 2011;114:246-50. Vercauteren MP, Hans G, De Decker K, Adriaensen HA. Levobupivacaine combined with sufentanil and epinephrine for intrathecal labor analgesia: A comparison with racemic bupivacaine. Anesth Analg 2001;93:996-1000. Palmer CM, Maciulla JE, Cork RC, Nogami WM, Gossler K, Alves D. The incidence of fetal heart rate changes after intrathecal fentanyl labor analgesia. Anesth Analg 1999;88:577-81. Scott LJ, Perry CM. Tramadol: A review of its use in perioperative pain. Drugs 2000;60:139-76. Ng KF, Tsui SL, Yang JC, Ho ET. Increased nausea and dizziness when using tramadol for post-operative patient-controlled analgesia (PCA) compared with morphine after intraoperative loading with morphine. Eur J Anesthesiol 1998;15:565-70.